GENRE IS DEAD! Interview with Dog Party - GENRE IS DEAD! 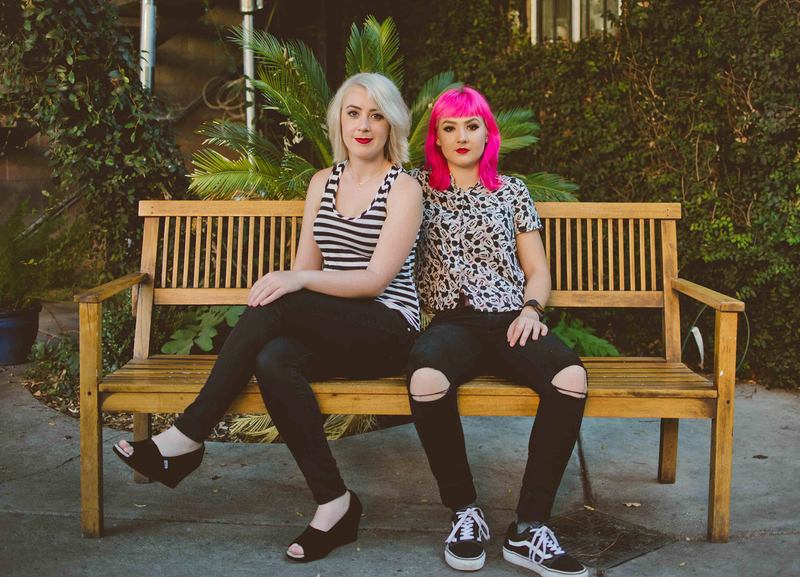 When you see Dog Party aka Gwendolyn and Lucy Giles, you would never guess that this band is over a decade old now: the two sisters started writing music when they were only 8 and 9 years old. Since then they’ve released five records, played hundreds of shows worldwide and even supported their idols Green Day during the North American leg of their Revolution Radio tour. Dog Party’s punk sound is fun, young, and incredibly addictive, so of course, we couldn’t wait to interview Gwennie and Lucy! First of all, can you describe Dog Party and its sound? Gwennie: We are a sister two-piece California rock band. Lucy: I like to describe it as good, fun Rock’n’Roll with a dash of punk and a pinch of pop. You two are sisters and personally, I could never even imagine being in a band with my sister. So the fact itself, that you two can, is pretty awesome! What does your family think about this? Lucy: Haha! I love being in a band with my sister. I personally prefer it! She is the best. Our parents have always been the most supportive and positive about the band. Gwennie: Being sisters makes band stuff way easier in so many facets. From songwriting to picking times to tour, we are more often than not on the same page. You’ve been a band for 10 years now! First of all, congrats to that! What were the biggest challenges of the band during that time and how did you overcome them? Lucy: Thank you so much! This question made me think for a hot sec. Definitely I think it is most important for a band that has been around for a while to keep fans engaged and interested. You have to be creative – but that’s what it is all about! It hasn’t been too much of a challenge for Gwennie and I, because that’s what drives us. Gwennie: It’s been so great to see our musicianship, songwriting, and stage presence grow over the past 10 years. Probably one of the biggest challenges for me, though, is still being considered a younger band despite our experience and time in the industry. Did you celebrate your 10-years anniversary somehow? According to your Facebook page, you’re currently working on new material. How far is the progress right now? Gwennie: I am super stoked how everything turned out! Just need to crank out some album artwork to keep everything on schedule. Can we expect the “usual” Dog Party-sound on the new record or are you going into a completely different direction? Lucy: Fans can expect our signature sound! Loud fuzzy guitars and thunderous drums. It is so fun writing new material because our songwriting keeps developing. One could say it’s a more mature but obviously still fun and high-energy. Gwennie: I partially agree with that statement! Haha. Some young female fronted bands such as The Regrettes or Bleached are very vocal regarding feminism in rock music. What is your stance on that and do you think it’s vital for female fronted bands to take on this issue? Lucy: Gwennie and I are huge feminists. Every set we play, we finish off with Rebel Girl by Bikini Kill. I love seeing girls’ eyes light up when we play the song. It makes me feel like I am continuing to carrying the torch for Riot Grrl bands. I feel like it is a vital part of our band to make girls feel badass. Our goal is to rock and own the stage to give other girls the confidence to do it, too. Gwennie: Yeah, I can’t stress enough how important it is to take stage and show young girls that us girls can rock, too! Especially with everything that it happening in the U.S. right now… it’s a topic that cannot be overlooked. You toured with big acts like Zebrahead and even “God’s favorite band”, Green Day. If you could choose your next tour companion, who would it be and why? Lucy: I definitely wouldn’t mind Green Day pt. 2!!! Now that would be a blast!! I think it would be amazing touring with Best Coast– Bethany is such a strong front woman and she inspires so many. Gwennie: I love the down-to-earth nature of so many of the artists we have played with over the years. I think it would be fun to do something with Joyce Manor – they are so friendly and put out great music. You’ve played at the infamous Punk club 924 Gilman in Berkeley stepping into the shoes of some huge acts such as Green Day, Rancid, Bikini Kill or The Offspring. Has this place influenced you, your music and/or how you run your band somehow? Lucy: It’s always a blast playing at Gilman. I’ve been playing there ever since I was 12. It is definitely a magical place. I can feel it every time I’m there. Seeing the history on the walls gives me a sense of pride that I too get to make my mark there. Gwennie: Gilman provides so much for the Bay area music scene! We try to find similar venues when we book shows outside of California. What was your most special concert moment so far? Lucy: Hands down when we played at the UC Theatre in Berkeley with Green Day. Lots of our friends and family were there. It was honestly the best set we’ve ever played. I couldn’t stop smiling while I was on stage. Gwennie: Yeah, that was a pretty phenomenal night! We do hope that you will come to Europe soon. Do you have any plans in that direction yet? Lucy: We hope so, too!!! We currently do not have any plans. Boo! Gwennie: We would love to come back to Europe, but nothing is in the plans as of now. Which new bands do you recommend to our readers? Lucy: We always recommend our good pals SWMRS. Gwennie: I am really into White Reaper right now!